Integral to process control in many industries, level measurement sensors fall into two main types. 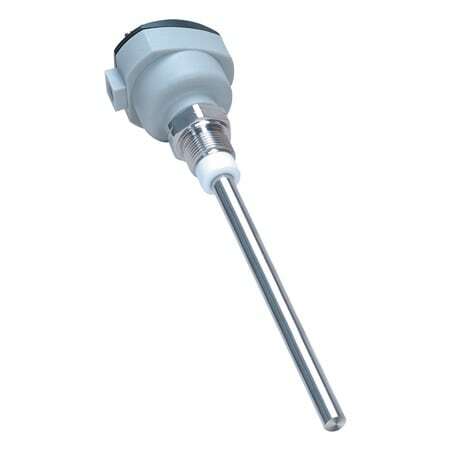 Point level measurement sensors are used to mark a single discrete liquid height–a preset level condition. Generally, this type of sensor functions as a high alarm, signaling an overfill condition, or as a marker for a low alarm condition. 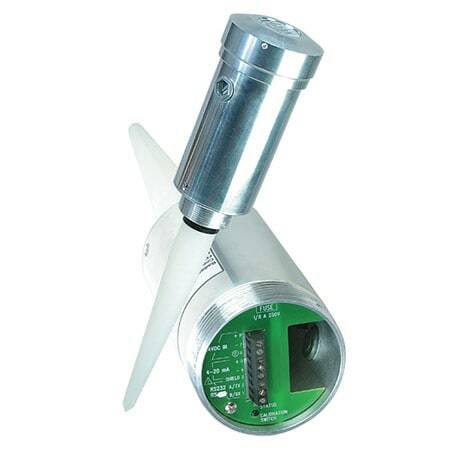 Continuous level sensors are more sophisticated and can provide level monitoring of an entire system. They measure fluid level within a range, rather than at a one point, producing an analog output that directly correlates to the level in the vessel. To create a level management system, the output signal is linked to a process control loop and to a visual indicator. What is a Float Switch? In these point level sensors, a magnetic float moves with the liquid surface, actuating a hermetically sealed "reed switch" in the stem. The simple, low-maintenance design installs readily; minimizes shock, vibration, and pressure; and works with a variety of media. The reed switch can be single pole, single throw (SPST) or single pole, double throw (SPDT). These sensors incorporate an analog signal processor, a microprocessor, binary coded decimal (BCD) range switches, and an output driver circuit. Transmit pulses and a gate signal from the microprocessor route through the analog signal processor to the sensor, which sends an ultrasonic beam to the liquid surface. The sensor detects the echo from the surface and routes it back to the microprocessor for a digital representation of the distance between the sensor and the surface level. Through constant updating of received signals, the microprocessor calculates averaged values to measure liquid level. With a continuous sensor, the microprocessor converts the averaged value to an analog 4 to 20 mA signal linear with the liquid level. When the echo from the level does not return to the sensor within 8 seconds, the output signal from the system drops below 4 mA, indicating a low-level condition or empty pipe. With a point sensor, the microprocessor compares the averaged value with the BCD switch setting and energizes an output relay for either high or low level indication. A signal loss exceeding 8 seconds de-energizes the relays and restores their original state. The electronics incorporate a half-second delay that minimizes surface turbulence effects. A low-energy ultrasonic device within these sensors measures liquid level at a certain point. 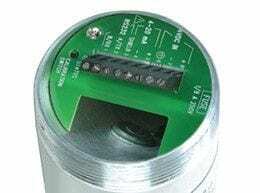 Consisting of a field-mounted sensor and integral solid state amplifier, contact ultrasonic sensors have no moving parts and require no calibration. Typically, they are equipped with terminal blocks for connection of a power source and external control devices. The ultrasonic signal crosses a one-half inch gap in the sensor, controlling relay switches when the gap contains liquid. The sensing level is midway along the gap for horizontally mounted sensors, at the top of the gap for vertically mounted sensors. As liquid falls below this level, the ultrasonic signal attenuates and ultimately switches the relay to its prior state. These sensors are used in vessels or pipes to automatically operate pumps, solenoid valves, and high/low alarms. 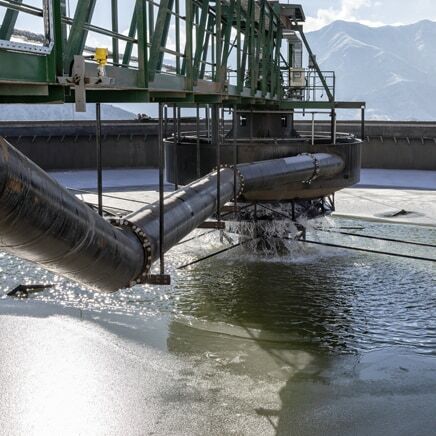 Two would be required to fill and empty tanks, and to meter liquid volumes. Compatible with most liquids, they are unaffected by coatings, clinging droplets, foam, and vapor. However, highly aerated liquids and liquids viscous enough to clog the sensor gap may cause problems. 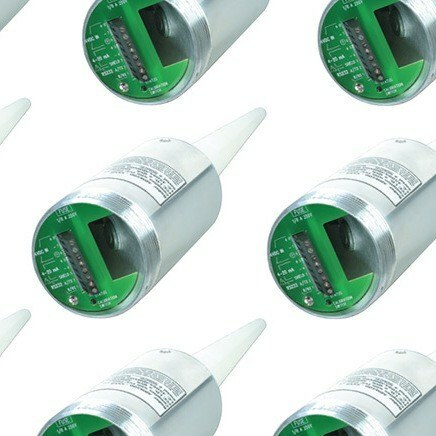 Like ultrasonic sensors, capacitance sensors can handle point or continuous level measurement. 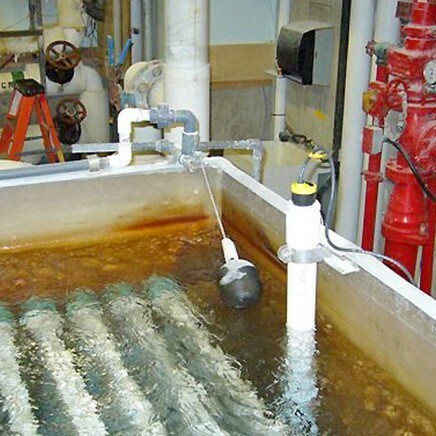 They use a probe to monitor liquid level changes in the tank, electronically conditioning the output to capacitive and resistive values, which are converted to analog signals. The probe and the vessel wall equate to two plates of a capacitor, the liquid to the dielectric medium. Because the signal emanates from level changes alone, material build-up on the probe has no effect. 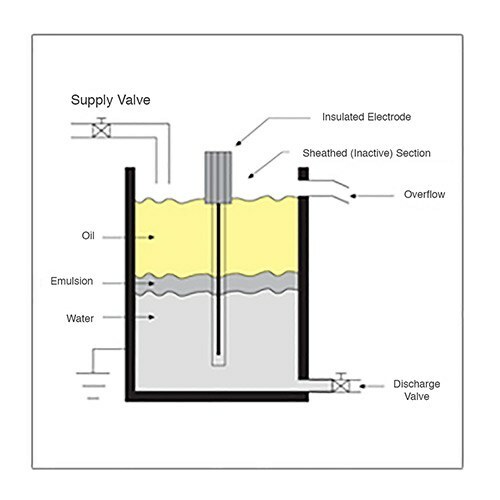 Non-conductive fluid vessels may dictate dual probes or an external conducting strip. The probe, which can be rigid or flexible, commonly employs conducting wire insulated with PTFE. Using stainless steel as the probe's base metal provides the extra sensitivity needed for measuring liquids that are non-conductive, granular, or low in dielectric properties (dielectric constant less than 4). Flexible probes must be used when there is insufficient clearance for a rigid probe, or in applications that demand very long lengths. Rigid probes offer higher stability, especially in turbulent systems, where swaying of the probe can cause signal fluctuations. With power and programming options, RS-232 or RS-485 communications capability, pushbutton calibration, and temperature-compensated signaling, The LVU40 Series ultrasonic level sensor bring another dimension of flexibility to continuous non-contact liquid level measurement. Highly accurate over their entire range of 0.3 to 18.3 m (1 to 60'), they incorporate filtering that virtually eliminates false echoes from peripheral obstructions. In conjunction with a PLC (programmable logic controller) or an OMEGA CNi Series controller, they can be used for point level measurement. 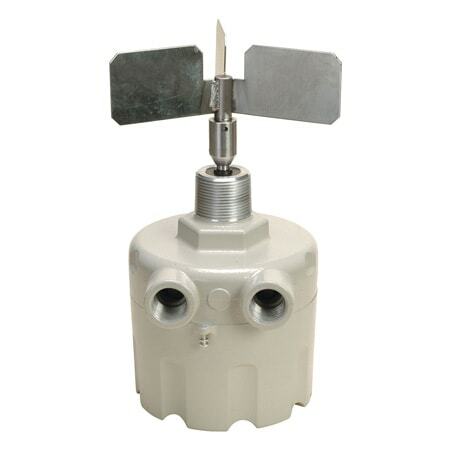 In applications requiring non-contact measurement of liquid levels, the affordable LVRD500 radar transmitter is the logical extension of ultrasonic sensors. They are ideal where vapor, dust, or a foaming surface prevents ultrasonic measurement. Their radar sensor uses microwave pulse technology to track target liquids from the antenna tip to the bottom of a tank. This advanced "echo marker" signal processing provides a reliable continuous pulse shape unaffected by environmental conditions. RS-232 and RS-485 models are available. The pocket infrared thermometers are extremely compact. They are normally small enough to be carried in a shirt pocket. Compatible with many granular, pelletized, and powdered substances, LVD-800 Series rotary paddle level switchese use patented magnetic technology that makes fail-safe bin, hopper, silo, and tank monitoring a reality. A self-diagnosing microcontroller constantly monitors rotation of the shaft and motor mounting plate, reacting immediately to material presence and to mechanical or electrical failure. Magnetic sensing avoids the fouling problem inherent to optical systems. The twist-on cover does away with bolts, there are 2 conduit entrances, and most models have a status light. High-temperature models are rated to 399°C (750°F). A is a small low cost infrared sensor. They are unique in that they are self-powered and produce an output that mimics a thermocouple sensor. Able to withstand high temperatures and pressures, and impervious to many corrosives, LV3000/4000 Series level measurement probes give reliable continuous level measurements in difficult applications. Appropriate for liquids, pastes, and some solids–whether conductive or non-conductive–they have no moving parts and are easy to install. After rectifying and filtering incoming power, generating a radio frequency signal, and calculating changes in current, the electronic circuitry produces a 4 to 20 mA 2-wire output signal proportional to the process level. Convenient zero and span adjustments let the user factor in variables such as media type, vessel dimensions, rod length, and installation position. If the stainless steel probe will be used near a conductive vessel wall, a PTFE-insulated model will prevent short circuiting. Are you measuring a liquid or solid? What are the application's temperature and pressure ranges? Is point level or continuous measurement required? What level measurement range do you need? Is the measured material electrically conductive? Will the material coat or build up on surfaces? Does turbulence, foam, or vapor occur at the surface of the liquid? Will you need contact or non-contact level measurement? What kind of output do you need–analog, relay, digital display, etc. ?